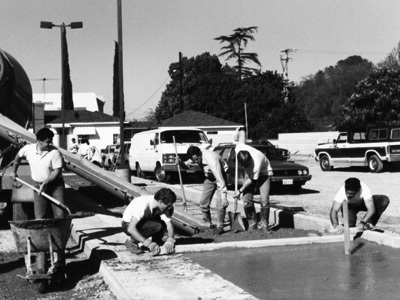 In 1982, with a small congregation of thirty some members, we began meeting in Cerritos. We obtained a lot right next to Wells Fargo Bank across from the Auto Club. A meeting hall that accommodates 200 was built in May 1985. We met in His name and we enjoyed our Lord’s blessing abundantly. Our fellow believers may identify us as evangelical, we like to call ourselves part of Christ’s body trying very hard to follow the Word and practice it. We Break Bread together every Lord’s day and share our enjoyment of the Word enthusiastically. Home meetings are an essential part of our church life too; the door to the enjoyment is never closed to all Christians and friends. We welcome every member of the body of Christ, denominational or none. In our home meetings, all participants are welcomed to share their experiences with God, and testify their blessings in their daily walks. The atmosphere of the meeting is warm, friendly and never demanding; everyone has a strong sense of belonging. Every Lord’s Day we meet in different languages with a total attendance of over 200. On weekends we meet in close to twenty home meetings. This is a big family where our younger generation starts their life in the faith as well. Young people meet in several groups according to their age. We also have Sunday school and care for babies and toddlers. Counting our blessings we total close to seventy young people and another sixty children including pre-school age. We have been in the neighborhood since and in June 2012 we are moving to our new facility on 12061 Del Amo Blvd., Cerritos, CA 90703, you are more than welcome to visit us at your convenience, whether you are a fellow believer just interested in sharing your enjoyment of faith or a seeker of faith.